Pompeii is a ruined and partially buried Roman town-city near modern Naples. 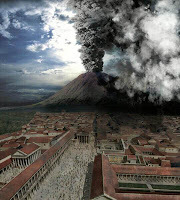 Along with Herculaneum, its sister city, Pompeii was destroyed, and completely buried, during a long catastrophic eruption of the volcano Mount Vesuvius spanning two days in AD 79. It is today a popular tourist destination. Some people of Pompeii grabbed their beasts of burden and attempted to flee the area; others perhaps chose to wait until the streets were clear of the panicked masses; still others sealed themselves up in rooms, supposing that the ashes and poisonous gasses would not harm them there. The unfortunate people who could not escape in time to avoid disaster were killed by falling buildings, overcome by the mephitic gas, or simply buried by the rapidly falling ash. Their bodies were quickly covered by the volcano's mineral deposits, which covered Pompeii in a layer more than 30 feet thick. Many more years of painstaking archeological digging followed. In 1939, Italian archeologist Prof Maiuri, discovered an artifact in the ruins, that had a very Indian origin. This ivory statuette which survived the disaster and lasted all these 2000 years was identified by Prof Maiuri as that of the Goddess Lakshmi and dated to around 1AD. It has since then been quoted as the ‘Goddess Lakshmi statue in Pompeii’ in many books & articles. The statue portrays Lakshmi, Indian divinity of feminine beauty and fertility. Naked, with two handmaidens at her sides bearing toiletries, her body is adorned with heavy jewels: a diadem on her forehead, a necklace on her chest and large and numerous rings on her ankles and wrists. Her long hair, also richly embellished, flows over her shoulders down to her waist. She is probably one of the apophoreta, ‘gifts to be carried away’, as Martial recalls in his Epigrams, a sort of prize for winning the dice games which took place during the numerous banquets, consisting of silver, bronze or ivory statuettes. A round hole above the head suggests, however, that the statuette served the purpose of a handle, probably for a toiletry object, or that it was a support for some kind of furnishing. This small, rare sculpture, found in a modest dwelling in Pompeii, represents nonetheless an important indication of the trade relations that existed already by the 1st century A.D. between the Western Mediterranean countries and the East by means of the port of Puteoli, known today as Pozzuoli: created in Augustan times, the port received from every known destination spices, slaves, wine, grain, ceramics and precious objects destined for sale on the Roman market. Discovered in Pompeii, Casa della Statuetta indiana; in a wooden chest situated on the western side of the Viridarium . Rome played an important part in the Eastern oriental trade of antiquity. The Romans imported many goods from India and at the same time set up their own trading stations in the country. A particularly famous one was at Arikamedu (near modern Pondicherry), where Roman coins, amphoras and roman glass have been found. Trading in commodities from Southern India was very much to Rome’s advantage, and it is no accident that large quantities of Roman coins have been found in that part of India. According to Butterworth & Laurence in their book ‘Pompeii’ (Pgs 54, 55), the statuette reached Pompeii around 40AD through a caravan of traders via the overland route. This was actually the leg of an ivory tripod table. The authors note the uncanny resemblance of the poses of the two acolytes to Venus, the Greek goddess. The statuette was found in the house of four architectural styles. It was a period when antibiotics from China and religions like Hinduism & Buddhism from India etc reached Greece & Rome and multicultural Naples (Ghosts of Vesuvius -Charles R. Pellegrino (Pg 158. 159)). Two identical statues has been found at Ter (Tagara) Bokhardan (Bhogavardhana) in India, testifying the statue’s origins, however the fact that it is goddess Lakshmi is hotly disputed. The book ‘State intervention and popular response’ - By Mariam Dossal, Ruby Maloni (Pg 46) gives further information that this statue originally thought to have been made by ivory carvers (dantakara) in Mathura actually came from Bhokardan. In "The making of Roman India" Grant Parker thinks it might have been the leg of a small piece of furniture and disputes it being a representation of Lakshmi. Moeller (The wool trade of ancient Pompeii Walter O. Moeller Pg 76) feels that there existed a trade of dyestuff between Indian and Pompeii based on the fact that the building next door to the one that housed the statuette was a dye house. So he feels that the statue perhaps came together with a shipment of Indigo dyes. So how did the statue find its way to Pompeii? Did they go with Indigo dyes from the south or via overland caravan trade? Most likely it went with spice ships that plied the Malabar & red sea coast, then overland to Alexandria and again by sea to Naples. Puteouli (Puzzuoli) near Naples had a major warehouse constructed by Domitian as early as 78AD to stock Indian spices. So the spice trade was in full swing at that time or even before that. At first look it did not look like a goddess statue to me. The statue itself bears little resemblance to the Goddess statues of India. Also I felt that a goddess statue would not be passed around as a toiletry object or become a part of table legs. Looking at the hair and ornament styles, they somehow do not seem very Indian to me, mainly the hair style behind the neck. The bangles in the arms and feet look African or Rajastani Banjara type to me, and unlike a high class figurine. The figure is also less buxom compared to usual Indian statues. So was it an ivory table ‘made to order’? Was it perhaps a Yavana sculpture from Arikamedu or Pondicherry in Tamil Nadu? Could very well be and we will never know for sure, its origins. Amazing! This little statue survived the intense heat of the lava, the disaster and is now a testament to the trade relations between the ancient Greece, Rome & India dating back over 2000 years. you know its mind boggling to think that there might have been trade relations that long ago. I had read somewhere that these gold ingots consistently come up ( in wells and all). It might not be a complete stretch for it to be lakshmi tho. one because i would assume the manifestations of the goddess has changed significantly over time - so this could have been the earlier avatar and if you also look at the commonality of language - words that sneak in to india and european languages - indicates that there was certainly some movement happening. This was such a interesting read. From volcanoes to Goddess Lakshmi. The Pompei Laksmi does not seem to fit into the scheme of things with the Indian iconography. I have noticed that the lips are thicker and looks tribal. Thanks for the interesting post. Very interesting. India had an active trade with the ancient Greek and Roman worlds - there is ample evidence of this also from artifacts from those places found in India. I have seen the museum in Pondicherry, where they have a whole section for Roman artifacts (including large, intact amphorae) found around that area. Just wanted to mention that Yavana Rani was written by Sandilyan and not Sujatha. I feel bad that when I visited Pompei about 15 years, I had not heard about it. I agree about your comments that it looks more inspired from Yavan kind of statues and could have been made for export. However, I am not so sure if it is supposed to resemble the Laxmi pictures we are used to now. Hasn't there been an evolution in the way Laxmi is visualized over the past two thousand years? Do the Laxmi goddess origins go back 2000 years? Sunil... I had a chance to see a photograph showing the back of the statue. The hair style is so foreign - i have not seen it in any indian book or picture. Also i checked out the question on how Sri or Lakshmi looked. According to pictures on 1BCE & 3BCE coins from Mathura, she was depicted with and without elephants, the lotus etc. With elephants around, she is termed Gaja Lakshmi. Later versions depicted nagara Lakshmi or Raja lakshmi. (source - Images of Indian goddesses - By Madhu Bazaz Wangu). SO Sri & Lakshmi go back to Vedic times,though Sri appears on the scene only after the Harappa - Indus civilization. Thanks Kamini, Some day I will visit the museum at Pondi. The Poompuhar history is very interesting and Sandilyan's book is simply not available in English it seems. Sad I cannot read Tamil though I speak it well. Thanks Mathew - Will take a look. The part of the hair after the neck does look similar to tamilian style of knotting hair. Lots of tamil women even now knot their hair (its one strip of knots, or max 2). But the knots are usually intertwined, unlike this. It could also be that the knotted strip of what we call hair below the shoulder is not hair but a garland of flowers stitched together. Sabarish, I have posted the photo of the rear of the statue, now you may follow my line of thought. wonderful post.we had been to pompei and it was an amazing trip. Interesting Post. I came to see some "Arikamedu" sculptures at Bangalore Museum. ie Karnataka Folk Museum,Kumara Park West, Sheshadripuram. In France , at the Archeological Museum of St Germain En Laye there are some utensils unearthed from Arikamedu. I have just finished a degree in Roman Archaeology, whilst talking to an Indian Archaeologist, he put forward that the Lakshmi at Pompeii is actually a Yakshi; a mythical being of Hindu, Buddhist and Jain mythology. The Romans had a lot of contact with India, ranging from finery to pots of pepper. Some trade routes include the steppe, silk and sea roads. When looking at this statue, we need to be careful not to assign a religious significance to it. The presence of this is probably not showing the presence of Indian religion alive at Pompeii, but rather a love of eastern exoticism. Tipu, Unniyarcha and Wodeyar – truth or fiction?